The University of Oregon will ask many of its incoming campus residents to not drink or cook with water from residence hall bathrooms as a precaution, after seeing elevated levels of lead in some recent test results. Only about 21 percent of faucets and fountains tested have showed elevated lead levels, but to be cautious and avoid confusion, University Housing is telling occupants of four buildings to not drink that water while it makes repairs. 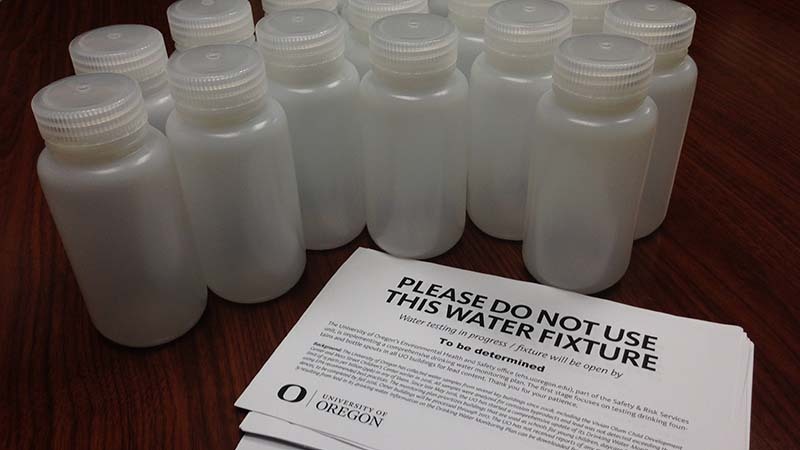 The UO plans to repair or replace fixtures as necessary to ensure water quality. University Housing is providing bottled or dispenser water to residents until then. Results arrived Thursday for Bean and Earl halls. As expected, Bean Hall had some fixtures with elevated lead levels, and occupants will continue to be told not to use water there for drinking or cooking. Also as expected, recently renovated Earl Hall had no elevated samples. A total of 19.6 percent of all residence hall fixtures tested have shown elevated levels. The Global Scholars Hall, opened in 2012, has not yet been tested. The U.S. Environmental Protection Agency sets 15 parts per billion as the “action level” for lead in public water systems. The UO is using that level to trigger additional tests to determine whether the lead is coming from faucets or from the water lines themselves. Water that tests normal after flushing for 30 seconds or so shows that a fixture may well be the problem, and most of the tests at the UO fall into that category. Those fixtures are being replaced. Like many public agencies with lots of buildings, the UO has been voluntarily testing for lead as part of a water quality monitoring program launched in late spring. The UO is just now getting the results from residence hall testing. Barnhart, Walton and Hamilton halls all had some fixtures with elevated results. Results are not back for Bean Hall, but because of the age of building fixtures, UO staff expect similar results to those for the other three halls. Even though only a portion of the fixtures in those buildings showed potential problems, all residents are being cautioned not to use the water for drinking or cooking as a precaution during the testing and repair period. Using those fixtures for washing is fine. Carson Hall had one elevated fixture that will be repaired. The Living Learning Center had no elevated results. Results are not in for Earl Hall, which just had a major renovation and replacement of fixtures and lines and is not expected to have issues. Global Scholars Hall, which opened in 2012, has not been tested yet but is not expected to have issues. University Housing is ensuring that water used in dining facilities is safe for consumption. Residents started moving in Sept. 14 and received printed and email letters explaining the situation and asking them not to drink or cook with water from the affected buildings. Residents who arrive in the coming days will receive updated information as more test results come back and as the UO makes repairs. Some 210 students were expected to move into the four affected residence halls Sept. 14. After the university’s main move-in day Sept. 22, some 2,510 students will reside in those four halls. Nearly 4,000 students live in university-owned facilities from late September through early June. The university is testing all fixtures dedicated to potable, or drinking-quality, water, such as drinking fountains, break-room sinks, bottle-filling stations, instant-hot fixtures or food-prep sinks. For water fixtures not dedicated to drinking water, like bathroom faucets, the UO is sampling about 10 percent of each fixture type on each floor of a building. Utility or lab sinks that are clearly not for drinking water are not tested. Lead in water is a concern because high lead levels can contribute to negative health effects especially for pregnant women, infants and children under 6 years old. People concerned about lead exposure should contact their healthcare providers. For more information about lead, read www.epa.gov/lead/learn-about-lead. The UO has collected building water samples sporadically in the past, including at the Vivian Olum Child Development Center and Moss Street Children’s Center earlier in 2016. All samples were analyzed for corrosion byproducts including lead, and lead was not detected exceeding the clean water standard of 15 parts per billion in any of them. Since late May 2016, the UO has pursued a comprehensive update of its drinking water monitoring plan, using EPA-recommended best practices. The monitoring plan prioritizes buildings that are used as schools for young children, daycare facilities and residences, with tests to be completed by fall 2016. Other buildings will be processed through 2017.